Your bedroom is the place you can retire to after a long hard day at work. It’s the place where you can gather your thoughts and relax for a little while, and the place where you can escape into your own little sanctuary. Your bedroom needs to be perfect for you and your interior is a very important factor in making sure this is the case. Your interior design is the main element in making sure your bedroom is relaxing, comfortable and inviting, and also in showing off your personal style. There’s nothing better than snuggling in to some fresh bed sheets and a cosy bed spread. Here are a few ways in which you can create the perfect bedroom for you and your desires. It’s really important to factor both style and practicality in your design stages, as you need to be able to get the most from your room, whilst still enjoying it and feeling at home. The first part to consider is your theme, colour etc. There are many themes out there for interior design ideas and each can apply differently to separate rooms. A few of these themes are cotemporary, Minimalist, Classis and Glam. This is where you need to think about your personal style, what helps you relax and feel at home. If you’re into sparkles, elegant materials and bold features then glam may be the style for you, whereas if you’re more of a simplistic, less is more kind of person then you may find minimalist designs are more up your street. Don’t overthink it however, just choose what you like, what makes you happy and ultimately what will help you when it comes to winding down and relaxing. Furnishings are the next key thing to consider. Your bedroom is the one room where you can be selfish and everything is about you. If you think you need extra storage space for those shoes and handbags, why not get some! You need to make sure your furniture is practical and suited to you. The bed is the main feature in any bedroom, as it’s the largest and usually in the centre, making it the first thing you see. If you want to go all out and add that extra special something to your room, a great feature to consider is a headboard. Headboards are perfect for adding extra character and style to a room without taking up any extra floor space. Then you need to think about your bedside tables. These are a must in any bedroom, as it’s so handy being able to keep your books, phone, glasses, water close by when you’re in bed. You can add a little character to these to, by adding lighting or even a vase of flowers. This will help brighten the room up and also make the room feel welcoming and homely. It’s usually a good idea to have matching bedside tables, as this adds consistency to your interior design and will draw the room together perfectly. Then you have your larger items, such as your wardrobe and possibly a chest of drawers. If you feel that you are the kind of person who needs plenty of storage space, then it’s always a good idea to invest in a chest of drawers. This way you have additional storage space, and the room will look a little fuller and exciting. If drawers aren’t for you, why not consider a double wardrobe. There are so many different storage devices available now, you can use them in the wardrobes to add sections for specific items which really helps you to keep organised. Finally, you may want to add a desk to your room. A desk can be used for many different purposes, such as a beauty area, work space, design space or even just to display photos or place your television. It’s a little something to add a little extra to your bedroom and its design. As your bedroom is designed to reflect your personal style, the additional pieces are simply down to you. 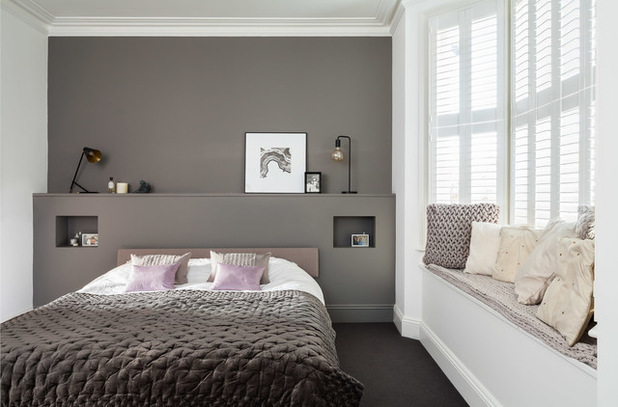 The best thing about a cosy, inviting bedroom is that when it comes to the end of the day, you know that you can escape to your bedroom and wind down in peace. You may want to consider a television, this is a great solution for those evenings where you just want to hop into bed and watch a film or documentary. If a television isn’t really your thing, why not consider a small book shelf or magazine table, to help with the winding down process, as there’s nothing better than escaping in a good book at the end of the day. Remember to keep in check with your theme, if you have decided to keep things simple and minimalistic then try not to overdo it with the details as you don’t want to make your room feel overcrowded or too busy. Now the exciting part – dressing your bedroom. This part of any bedroom design is the best, as you get to decide on what bedding to go for, curtains, basically everything that makes your room burst with character and style. Once you’ve decided on your furniture and additional items, the materials and colour are what really make the room stand out. Think about the style you’ve chosen to go with, try and stick to colour schemes and materials. By having colours that complement each other you will find you room ties together perfectly and you’ll have created the perfect atmosphere. When it comes to your bedding, it’s so important to make sure you’re going to be as comfortable, cosy and content with the design as possible. A great way to add a little extra to the bed is by having your pillows alongside some statement cushions, this will bulk out your bedding and also create a cosy, inviting feel. Having a throw will also create a really nice style and add a little extra to your bedroom’s design, try and stick within the colour scheme and your bed will look irresistible. With your curtains, decide whether you want a simple, delicate material with a blind for the window, or a stronger, thicker material that will work as a curtain as well as a display feature. Making sure your colours complement each other well, patterns are always a good idea for curtain design. Adding other little bits such as curtain tiebacks and door handles in a matching finish to finish off your rooms design. If you’re going for a minimalistic design, black door handles with a black curtain tie back would look great and stylish, or if your style is more glam why not select from a range of silver or even matte finishes to really inject some extra character into the room.